If your idea of a perfect home has an abundance of space, ample storage and an attached garage, the Ashton, a Meadowood Carriage Home, may be the perfect fit for you. 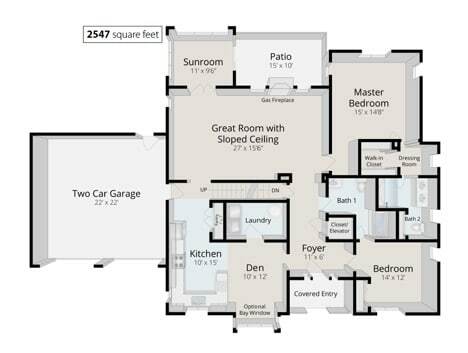 In addition to a spacious main level, the Ashton features a flexible second-floor living area that can be used as storage, a guest space, a den, an office, or a hobby room! Some homes even feature basements. The first thing you’ll notice as you enter the Ashton is the covered entry. Protected from the elements, you can decorate this area to truly reflect your style – before visitors even enter your home! Once you enter, you’ll find yourself in the foyer, which features either a closet or an elevator. Ahead, you’ll see through to the great room and then the spacious patio. To one side, you’ll find the second bedroom and on the other, you’ll find the den. The den, with an optional bay window, is a cozy space that could easily double as a dining area, as the kitchen opens into it. However, the den could also easily become a library, an office, or a game room. Connected to the den, you’ll also find the enclosed laundry room. The kitchen has plenty of storage, and two windows cascade sunlight into the space. The additional pantry means you’ll have more than enough room to store your go-to small kitchen appliances, plus plenty of places to stash your favorite snacks. High-end finishes and stainless steel appliances complete the luxurious look and feel. Just past the kitchen is a hallway – on one side, you have access to the enclosed two-car garage, and the other side has stairs to access the upper and lower levels. Beyond the hallway, you’ll find the Great Room. This spacious room features a gas fireplace and windows that overlook the patio. You could easily fit both a living room set and a dining set in there, should you choose. The sloped ceiling adds height and grandeur, making it an impressive space where you’ll love spending time. Off the Great Room, you’ll find the sunroom and patio. The enclosed sunroom will allow you to enjoy Meadowood’s beautiful campus year-round, no matter the weather. The addition of the patio provides opportunity to enjoy the outdoors from the privacy of your own home. Also off the Great Room, you’ll find the master suite – a large bedroom with a spacious walk-in closet and separate dressing room. Beyond the dressing room, the private bathroom with dual vanities will be your perfect haven for retiring for the day. The Ashton’s thoughtful design places the master suite away from the main entrance and the garage – providing privacy and views overlooking the patio and beyond. Heading back toward the main entrance, you’ll find the guest bathroom: a modern, high-end, four-piece room with access to both the hallway and the generously sized second bedroom. Coming in at more than 2,500 square feet, the Ashton is just one of the remarkable, luxurious living options at Meadowood. With two bedrooms, two bathrooms, a den, a sunroom, and a patio, it’s a great choice for those who want the space to accommodate guests and host parties and holidays. For more information on making the Ashton your home, call a member of our team at (610) 584-1000 or click here!